Dear StreetHunters.net Readers! It is time for the Monthly Theme Contest for September 2014! The Monthly Theme Contest is a fun activity that anyone can participate in! Every month we choose a Theme. What we ask is for you our StreetHunters.net Readers to participate by each sending to us a Street Photograph at streethunters.net@gmail.com based on that Monthly Theme. So for example if the theme is The Colour Red, then we would like you to each send a photo with a Red Colour moment. Your photo can be taken any time in history, we don’t mind, as long as it has been taken by you and nobody else. Once you send us your picture, we will decide which are the 5 or 6 or 10 best ones and we will post them on our website. Once that has been done, the next step is to ask you all to vote for the best photograph out of the ones submitted. The best photograph will earn one spot in the annual StreetHunters.net 2015 calendar which we hope to print at the end of the year! At the end of the year we will ask you to vote for the BEST of all the 12 photos. The best photo will win a FREE copy of the calendar! We know it is not much, but that is all we can offer at the moment. In addition to being in the Calendar, the best photo will also be used as the Street Hunters Cover photo in all our Social Media channels! 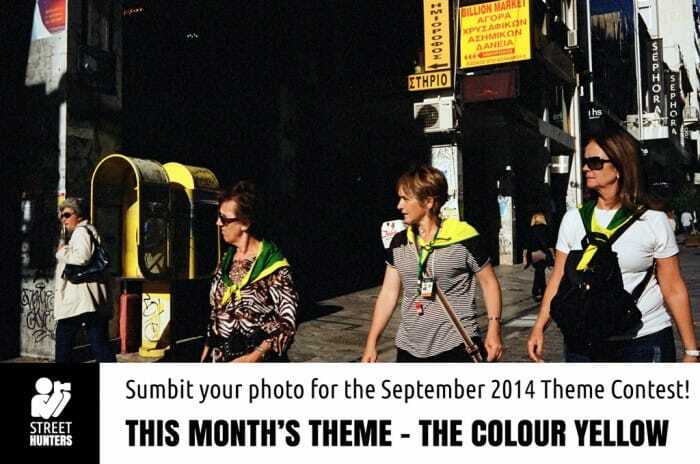 This month we would like to ask you to participate with Street Photos of “The Colour Yellow”. Anything goes as long as it is a Street shot and as long as the dominant colour is Yellow or at least the colour in focus. For example a photo of many people wearing different clothes out of which one is wearing yellow, isn’t a Colour Yellow shot. Selective colour shots aren’t going to be accepted. What are the following month’s Themes? You can start sending photos for this month’s Theme Contest from now and the end of the submissions are on the 15th of September 2014. After that and for 15 days, we will setup a Poll to determine the winner. The winners will be announced during the first part of October! Photos must be 1680 x 1116. Photos can’t have been shared in the SHRC before. A Reader can change the 1 photo entered if they change their mind before the poll is published. All winners throughout the year will be requested to send their photos over in High Resolution (8mp = 3,264 x 2,448) by December 2014. Please keep that in mind so you don’t accidentally enter the competition with low res only images from old iPhones or smartphones with low res cameras. If you enter a film snap, then a 5mp = 2,592 x 1944 high dpi scan will do. We will not use your photos for anything else other than this event. So, don’t just sit there! Email us your photos at streethunters.net@gmail.com now!